I have been wanting to make a coq au Chardonnay for so long, and after a fair amount of research into the recipe, I had a clear idea how I was going to approach it. I wanted to make a white wine version of the famous coq au vin and I wanted to use one of my favourite Chardonnay. Whenever I want to tackle a classic recipe, I always turn to Felicity Cloake from the Guardian and her ‘How to Cook’ column. She is at the top of the food writing chain and this is great place to start. In this particular recipe, as with all the others she covers in her column, she does loads of research and sets about testing a select few recipes by well-known chefs and food writers. 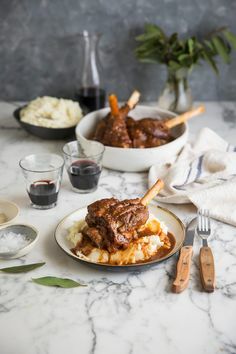 She mentions that she loves Nigel Slaters version of Coq au Riesling – the wine that is most commonly used to make a white version of coq au vin, but for this project she tested a few others and then gives a thorough post-mortem. While I think Nigels recipe looks delicious and I have been told it absolutely is, I sort of cherry picked my way around his and her final recipe to come up with my version for this exquisite dish. I thought it was important to soak the chicken in the wine for 12 hours (overnight). I know this may seem like a chore to do, but really the flavour of the wine literally seeps into the flesh of the chicken and adds so much flavour. It is the part about a coq au vin that makes it so special. I chose the De Wetshof Limestone Hill Chardonnay because its one of my favourites. It’s a full-bodied un-wooded Chard which I thought was perfect for this dish. It’s also great value which makes using it in a recipe more feasible, but I advise getting another bottle to drink with his meal. I added thyme, bay and parsley to the wine marinade as this made sense. I also cut up a whole chicken into eight pieces because I always love cooking chicken on the bone. For this dish its imperative. I would go with 8 thighs or a combination of thighs and legs if I was pressed for time and didn’t want to tackle a whole bird. I made a stock from the carcass and used some of it in the recipe to add depth of flavour. You could skip this and just add the wine as Nigel did. I preferred the idea of using cream only to thicken vs cream, egg and flour, and although my recipe had a little too much liquid, the process of reducing it down intensified the flavour so much, I wouldn’t want it any other way. The bacon and mushrooms were mandatory for my recipe, but the time to cook varies quite a lot between them. Nigel has his chicken simmer for 25 minutes, while Felicity cooks hers for an hour and a half. I found 30 minutes cooks it through but the meat doesn’t fall off the bone. If you want that, it’s better to cook it for longer. You will need a thick bottomed, wide dish with a lid such as mine to make this on the stove top. My cast iron Le Crueset Buffet Casserole dish was pretty much made for this recipe which is somewhat a labour of love. However what you put in is what you get out. I suggest serving it with a loaf of crusty white bread to soak up all the insanely delicious juices. Pasta or rice would be marvelous too. Joint the chicken and place the 8 pieces in a ziploc bag positioned in a tall bowl. Add all the marinade ingredients, seal, and store in the fridge for 12 hours or overnight. Place the carcass with the other stock ingredients into a large pot and fill with wnough water to just cover the chicken. Bring to a boil and then simmer on low for about 1 1/2 hours (cover). Allow to cool in the pot. Drain the stock and then return the liquid to a cleaned pot (a lot of scum will have developed around the sides) and boil this until it has reduced by roughtly half. This intensifies the flavour. Reserve one cup for the coq au Chardonnay and then keep the rest for later use. This freezes very well. Remove the chicken from the wine marinade at least an hour before you want to start cooking and drain it on multiple layers of paper towel. you want to try and get closer to room temperature before you start cooking. Add the butter and oil to your skillet and once bubbling hot, fry the chicken pieces in 2 batches until golden brown on all sides. Set aside. Clean the pan and remove any black bits. Fry the bacon until crispy and the set aside with the chicken. Add the butter to the pan and then fry the onion / leeks until softened and just starting to go brown. About 5 minutes. Add the mushrooms and garlic and fry for about a minute. Add the stock and deglaze the pan (scrape off any brown bits) and allow this reduce by at least half. This will take a few minutes. Add the wine and bring this up to a rolling boil and then add the chicken and bacon pieces back. Allow this to simmer over a low heat for 15 minutes with the lid on. Remove the lid, add the cream and continue to cook with the lid off for a further 15 - 20 minutes. If the sauce is still to thin after the 30 minutes, remove the chicken and then increase the heat. cook the sauce until it has reduced and thickened. Check seasoning and add salt and pepper. Return the chicken to the sauce and allow to heat through. Sprinkle the chopped parsley and serve. This sounds sensational and is totally perfect for this weather! Also adore that Chard! Fab fab choice! Looks delicious and I want to try it! Just to be clear, the ‘wine’ you are adding to the pan is the matinade the chicken was in right? HI Tappy, yes that is right. Hi Sam. Success! As suspected your version of coq au chard did not disappoint…beautiful pics as always…can’t wait to try it out! We have such a wonderful bunch of very chic new generation Rieslings available. I’m making this tonight with the Paul Cluver Ferricrete Riesling (although I am very partial to Hartenberg and Thelema Rieslings too). I plan on salting and drying the chicken on a rack on the fridge, because science tells us it’s the dry surface you want for browning not the increase to room temperature. I’ll let you know how it goes. Thanks for all your ideas and beautiful photos. It was totally delicious! All the guests, including a Frenchman were licking their lips. Hi Sam – For step #5 “Clean the pan and remove any black bits,” do you mean to just get rid of all the bits in the pan, or do you mean actually clean the pan as with soap and water?